I was eager to start weaving, and I thought about how I'd throw yarn side to side and make a sampler piece. I was told that it starts with warp. Warp is wound round-and-round the warping pegs. There is measuring and planning involved. Then the choke is tied off with a surgeon's knot, and each side of the crossed sequence of yarns gets tied off. Ends are cut (cut!?!) and the warp is carefully handled and chained. 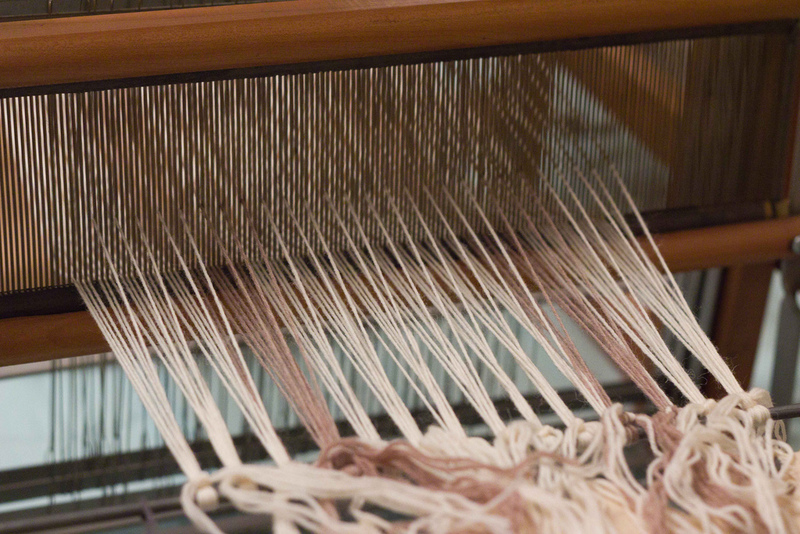 The loom is warped front-to-back. The choke is secured to the front apron. Lese sticks are on each side of the warp cross, and each strand is sleyed through the reed, without the process slaying the weaver. This is best done with a partner who can assist you and prevent you from giving up when you cannot see over-from-under anymore because you're concentrating so hard you forget to blink and you forget where you are. I'm only half-kidding. This was difficult. The heddles on the shafts are threaded in order, and small groups are tied off with an overhand knot and set aside. The small groups are tied to the back apron with square knots while making the knot tail lengths even from group to group. The choke is untied and the front yarns are divided into small groups. Each group is tensioned, starting from the center group and successively alternating side groups. The back apron is turned in small increments, paper is inserted in the roll, and the front groups are tensioned. 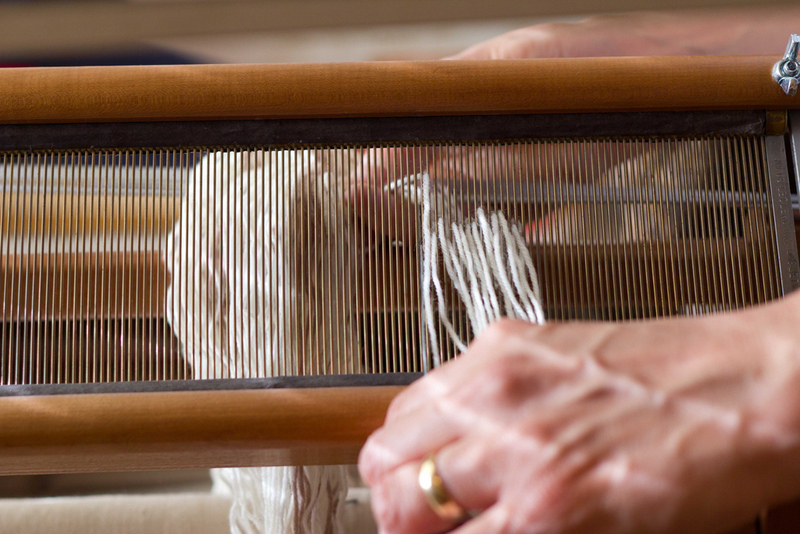 The entire warp is thus tensioned and wound from the front to back of the loom. As the hours passed I realized I had no idea this much work was involved. I kept asking "when do I weave?" At the front apron, each small group is secured (starting at the center group and working to the sides) with a half-square knot (the center group is secured with half of a surgeon's knot). After all groups have been secured, they are tensioned and secured by loosening the knot and pulling on the ends and tying the full square knot. The shafts are engaged one-by-one and the shed is checked for stray yarns (mistakes!) which are corrected. Everything is checked again, because there's no point in proceeding unless everything is in order. 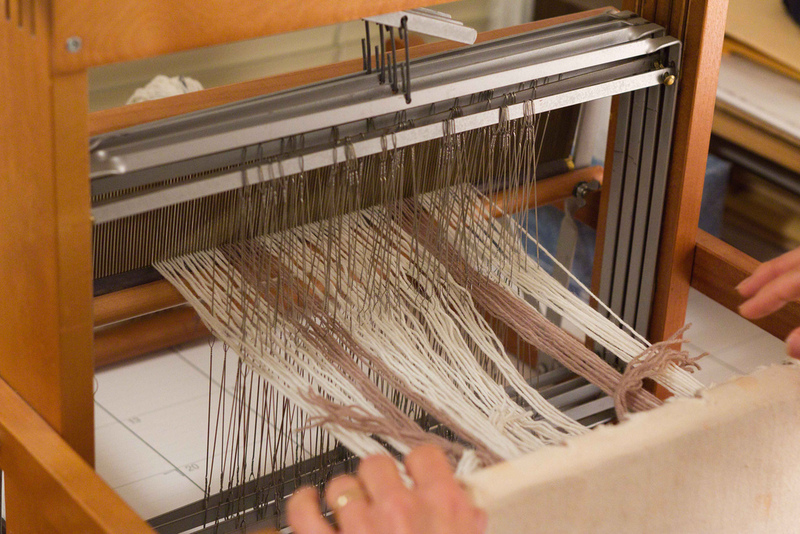 The loom is ready for weft. 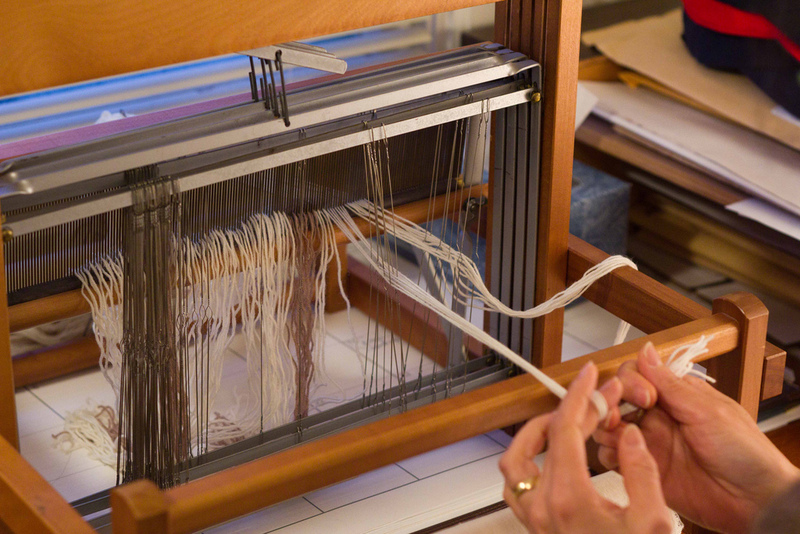 As 24x7 said, warping accounts for at least half of the weaving. Makes sense, doesn't it, when we see that at least half of the threads in a piece are the warp? I was weaving for the past four hours, yet I didn't realize it. 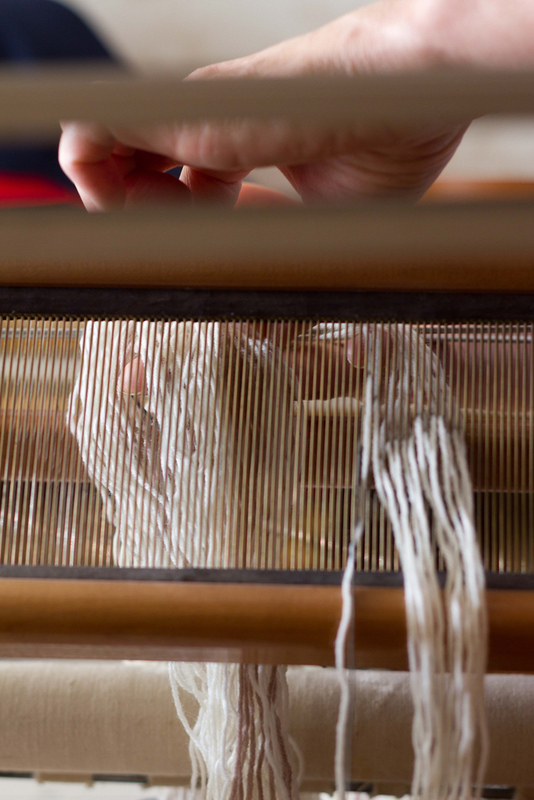 "I was weaving for the past four hours, yet I didn't realize it." Well said.